Choice of Rebels: Uprising — Lead the revolt against a bloodthirsty empire! We’re proud to announce that Choice of Rebels: Uprising, the latest in our popular “Choice of Games” line of multiple-choice interactive-fiction games, is now available for Steam, iOS, and Android. It’s 30% off until November 16th! Lead the revolt against a bloodthirsty empire! You grew up under the iron fist of the Hegemony. Now is your chance to end their blood-fueled magic, as you forge a ragtag outlaw band into a rebel army. 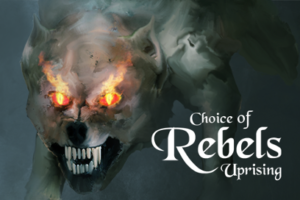 Choice of Rebels: Uprising is a 637,000 word interactive fantasy novel by Joel Havenstone, where your choices control the story. It’s entirely text-based—without graphics or sound effects—and fueled by the vast, unstoppable power of your imagination. As an outlaw rebel in the greenwood wilderness, you must steal to survive your first brutal winter, or watch your people starve if you can’t feed them. Win yeomen, helots, merchants, priests, and aristocrats over to the rebel cause…or turn them into your worst enemies. Will you defeat the army of the Hegemony’s Archon and the elite force of evil blood mages sent to destroy you, or will a personal betrayal put an end to your rebellion when it’s just barely begun? Will you gain a reputation as a compassionate idealist or ruthless insurgent? Can your rebels survive the winter and a vengeful army? How much will you sacrifice to rebel, and save your homeland from an oppressive empire? We hope you enjoy playing Choice of Rebels: Uprising. We encourage you to tell your friends about it, and recommend the game on StumbleUpon, Facebook, Twitter, and other sites. Don’t forget: our initial download rate determines our ranking on the App Store. The more times you download in the first week, the better our games will rank. My poor Rebel died on playthrough 1! Great work in building a challenging COG, Havenstone. Which first path is everyone taking? I’ve always been partial to the Jongler route, myself. I think you wanted to present this like a list instead of a paragraph. How low does my anarchy need to be to recruit the noble instead of Kala? My anarchy is currently at 22 and Kala keepa joining my band. Also, tips on keeing your anarchy low and your rebels well fed/alive? Now, I’m sure there are still bugs to be found. Please please please take SCREENSHOTS of the bugs, and then email those screenshots to support@choiceofgames with a description of the problem. IIRC from the forum version of the game, you need Anarchy 18 or less for Simon/Suzanne to join your band. Otherwise you get Kait/Kala. The trade-off between minimizing anarchy and feeding your people is one of the key conflicts of Chapter 2. Things are a bit easier if you allow the harrowing to happen, as you won’t have as many people to feed. Otherwise, good luck! It’s finally here. Already bought it on Steam, now I begin my madness. I will lead my bloodless, calm revolution through this game to the already anticipated sequels. The bloody revolution is the costly one. I’m not sure yet how much the game has been rebalanced since the open beta closed, but when last I played, the key to a well-fed rebel band was mules. Doesn’t matter how much money you have to buy food or how much you get on raids, if you don’t have enough mules to carry it all you’re up the creek without a paddle. Scout for places to steal mules from on the first week and make those raids a priority when they eventually come up, also send Breden on missions to beg for mules (tho this won’t work if you piss off the yeoman iirc). Raid yeoman farms if you’re desperate, but make it up to them as soon as you can. Around 15 mules can carry enough food to feed a large band on full rations, though you may want to keep around 20 depending on how many sick people you have. Any extra mules you don’t need, don’t hesitate to sell them. They bring in good money. Try to offload as many children as you can onto the helot camps, they’re useless mouths and make the task of feeding everyone a lot harder. Ways to get food without creating anarchy are begging missions to the helot camps (you can have them take care of some of your kids each time). Send the max amount of people led by someone with good charisma. This will account for a large chunk of your food supply on a low-anarchy playthrough. Supplement with strategically chosen raids focusing on getting money instead of food (rob temples, merchant caravans, and the architelone - make sure to have Bleys join your band), this way you can bring in most of, if not all your weekly food requirement by simply buying it. Creates less anarchy than stealing food, with the side benefit of freeing up more of your outlaws for other stuff. Don’t hunt if you can avoid it. Hunting for bears doesn’t work a lot of the time and rabbits bring in very little. If you have some outlaws free that you can’t do anything else with, you can get a little food and money by having them hunt rabbits. Otherwise, don’t bother. I did it! I broke their army in open battle, no magic! And the only major character I lost was Kalt! How did you do such a thing? As far as I recall the benefits of having a COM2 character. Congrats, @havenstone, on having our biggest opening day ever! Thanks to everyone at Choice of Games who had the patience to bring this ungainly beast of a story to the market. And, again, to everyone on the forums whose advice over the years helped make it a better beast. I haven’t even started to read game itself yet, but from the looks of World Index section I guessing that your work likely goes straight into my list of favorites. After all, thoroughfull worldbuilding is one of my most favorite aspects of fiction(together with romance and engaging story). I also must say that i amazed by your ambitions(considering amount of planned books and size of the first one) and equally afraid at prospect of how many years it could take to finish whole story. Nonetheless, I wish you good luck, bottomless enthusiasm and enough of free time in your life to continue and, eventually, finish whole series. But what’s important is building up a strong band (numbers and weapons), attracting experienced support, and keeping morale high. You probably won’t be able to do it (without magic) if you aren’t willing to get high anarchy, but even while you’re looting and stealing, you need some support, so don’t put the screws to everyone. Can’t really do anything more detailed now, but that’s the broad gist of it. And now, Breden speculation: she gives you a kryptast code that works (I can’t believe I have to lose the battle for that sword @Havenstone!). I don’t think it’s a question of if they’re a spy anymore, but how divided she is by internal conflict over the whole rebel situation. It depends a lot on the MC’s attitude towards them (Breden tries to save the MC, not the rebellion), and I’m curious to see how their goals will shift as the rebellion grows. And I’m dragging them into Xaos. I feel like maybe Breden is actually brainwashed and they don’t even know they’re a spy but maybe I’m wrong. I feel like what Linos said where he claimed the Hegemony actually loves a rebellion because it’ll let them murder as many people as they want while claiming rebels is a good enough explanation for a Kryptast spy trying to gather an insurgency. You are right. I played the game with COM2 today and even then was unable to win the battle, so there is more to it than that. Awesome to finally see this released! Hope everyone enjoys this little (read: giant) masterpiece! Been recommending it to as many friends as possible, hoping they too buy it.